Oftentimes, people call Carolina Septic Pro for a septic tank/system inspection when they’re buying a new house or building in the Charlotte region. They want to know exactly what’s “going on” with their septic system before they buy the property, and that’s a great idea– after all, you can’t easily see what’s happening underneath a house or building– but we can thanks to our amazing camera technology. Carolina Septic Pro has the power to discover what it looks like in places you could never go– and probably wouldn’t want to, either! Septic inspections aren’t just for people buying places– they’re also done by any property owner who wants or needs to know what’s happening with their wastewater. A septic system inspection includes the septic tank, drain field, inlets, outlets and all attachments. The inspection will show if any parts of the system are damaged, and it will also show if the system was installed properly. If the septic tank or drain field are not buried deep enough, if they are not big enough to support the wastewater volume from the home, or they were not installed to properly drain and filter through, this can cause problems at a later date. If and when the septic tank on a property is really old, it might be time for a brand new one. If the last time one was installed was in 1940, it’s about time for a new one, right? 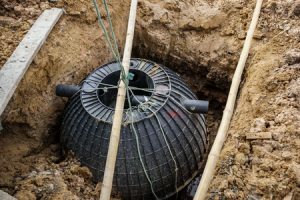 Meanwhile, many people prefer to stay independent of their local sewer system, such that having their own septic tank on their property is the logical choice. Rather than connect to a public sewer system, consider having a new septic tank installed on your property. That way you’ll have onsite wastewater treatment and avoid the high cost of sewer lines. Your new septic tank will last a long time– decades– and require pumping every few years. Maintaining your tank will save you money in the long run; it’s cheaper than sewage costs if/when you’re connected to the local sewer system. Septic systems are environmentally-friendly, treating effluent naturally and allowing water to seep into the ground nearby… and this keeps moisture in the soil on your property, which helps plants grow well. Meanwhile, a new septic tank is a smart choice because old sewer lines can leak– and that means untreated effluent can get into your soil and mess with your groundwater– not good! If you’re looking for a “green” choice to process waste, which doesn’t require energy or chemicals, then a septic system is the natural choice. 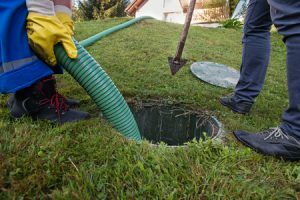 How Do You Know If You Need a New Septic Tank? Do you smell a “rotten egg” smell inside or outside your building? When you go outside and look where the septic tank is, do you notice a slimy black liquid in the drainfield area anywhere? Is there standing water in the drainfield/tank area? Do you notice soggy spots or damp soils with a bright green grass there? Have you heard “gurgling” sounds in your plumbing system or noticed sewage surfacing on the ground outside or worse– backing up into your toilets, bathtubs or floor drains? How about slow draining drains? If so, then you might need a new septic tank. Our experts can carefully inspect all areas of your tank. We can show you its condition and whether or not it needs to be pumped, repaired, or replaced. Our thorough inspection process covers the septic tank, drain field, inlets, outlets and all attachments. We can find out if any parts of your current system are damaged. Are there any cracks? Is the system the right size for the number of people using it? We’ll also assess whether or not your system was installed properly. If and when we find problems with your septic system, we then offer solutions. Ideally, we want to prevent backups and/or flooding. Carolina Septic Pro promises to explain what’s going on with your septic system in a clear and concise way that you’ll understand. Our company gives free, accurate and honest assessments. 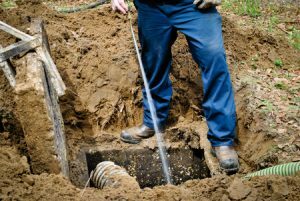 Call us today at 980-500-1022 to schedule a septic inspection for your home or business. We inspect septic systems in the Greater Charlotte region.